The question came up in the office last week, as we finalised the wall texts for a new show of eleven abstract works in the entrance court. Was there, perhaps, a more official-sounding term – something less slangy, more art-historical? When it comes to the artists in Forcefields , however, no other term will do. And none pop the eyes quite as energetically as David Aspden and Stanislaus Ostoja-Kotkowski (seen at far left and far right respectively in the installation view above). 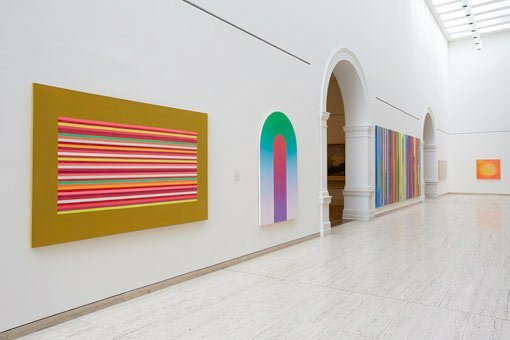 Local participants in the late 1960s flowering of Op and colour-field painting, both artists specialise in what might be called productive disorientation, feeding the eyes so much chromatic energy that the mind struggles pleasurably to process it. Ostoja-Kotkowski’s Sunrise , for instance, is a work that seems to radiate from within; a passing viewer even asked me during install whether the whole thing was electrically powered. It’s rivalled for wall power by the early painting of Aspden’s in the show, a very 1960s acrylic on canvas with the curious title Outer Spice . We know what ‘outer space’ is, after all, but what then is ‘outer spice’? A parallel culinary galaxy, perhaps, full of flavours unknown on Earth? The playful title is more than matched in the painting, which does highly evocative things with colour. The framing colour is deeply unpromising: mustard with distant notes of baby’s diaper. But the drabness of the surround only gives extra power to what happens in the space within, where Aspden has assembled an extraordinary sequence of shrill yellows, sharp greens and hot pinks. 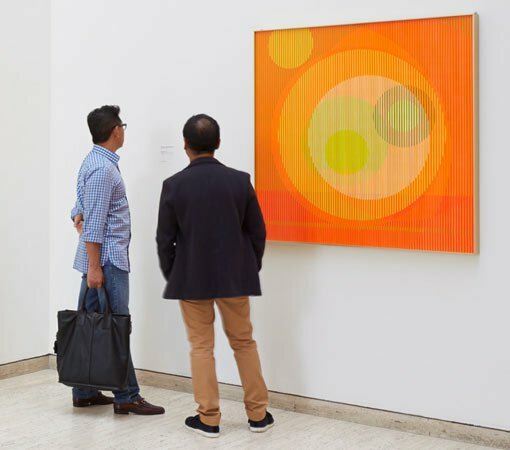 Abstract artists have long been interested in the quality known as synaesthesia, whereby visual sensations evoke in the viewer the sensation of, for instance, sound. 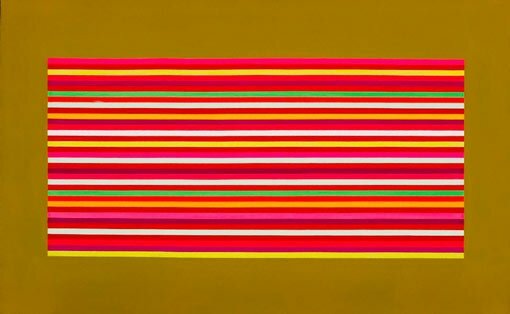 Aspden’s colours, however, generate effects that a viewer can almost taste: think of bright sweet seeds of candied fennel on the tongue at the end of an Indian feast. Outer spice, indeed.